Worn or frozen wheel bearings can cause drifting and wobbling that can lead to accidents. The only sure fix is a bearing change. Mikes XS carries a full line of XS650 front wheel bearings and XS650 rear wheel bearings. 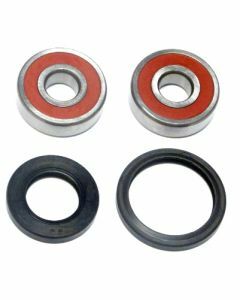 Our XS1 front wheel bearing kit comes complete with a new oil seal, but we also stock XS650 front and rear wheel oil seals. A bearing change is also a good time to replace your XS650 front and rear axle and axle nut.